We hope you can join us to commemorate the 57th anniversary of the rediscovery of Leadbeater’s Possum back at the area where it happened! 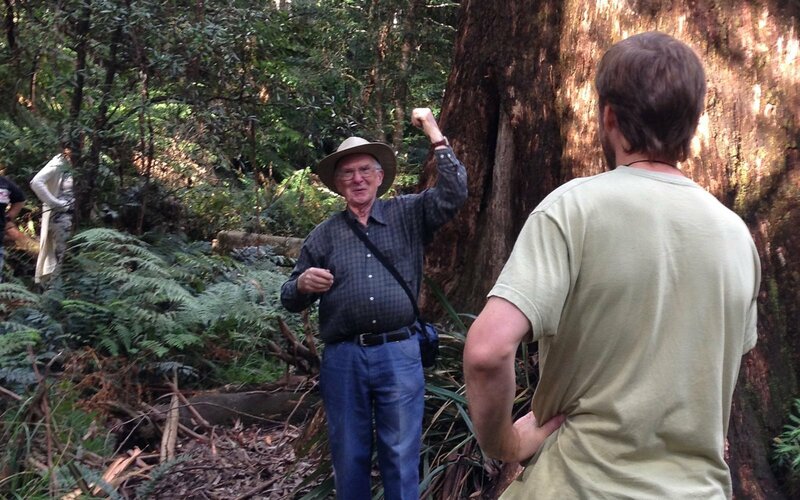 Following on from our event at the Melbourne Museum in 2011 to celebrate the rediscovery, we return each year to the forest area of the first sighting. We hope to be joined by Eric Wilkinson, who was in the right place at the right time 57 years ago to first see the species in the wild since they were declared extinct in 1960! There will be a BYO Picnic Lunch (we will supply hot and cold drinks and some nibbles but please bring lunch items, a chair and/or picnic rug). And then a forest walk that will take us from the Cambarville parking lot through the Mountain Ash forests, past the massive elephant tree, through a rainforest gully, past the “Big Tree” and on to the Cora Lynn falls area where you will view the unburnt gully above. On this walk we will discuss the recovery of the forests from the 2009 bushfires and the impact the fires had on Leadbeater’s Possum habitat in the area. The return walk will be approximately 1.5 hours at a slow pace but car lifts will be available back to the Cambarville parking lot if you wish to walk one way only. Plus we will also have a few things for sale including our gorgeous group logo t-shirts and professional canvas prints of beautiful Leadbeater’s Possum paintings by awarded wildlife artist, Liz Cogley, with exclusive discounted member prices. We will have some prints for sale on the day and more can be ordered if we sell out. These are really stunning and you can view them at our new website. Cambarville can be approached from two directions. 1: From Healesville, via Black Spur and Narbethong, then through Marysville and turn right along Woods Point Road approximately 15km beyond the Lake Mountain turn off (approximately 1 hour driving time). 2: Via Warburton and Reefton (approximately 45minutes driving time). Healesville, Marysville and Warburton all have delicious (and highly recommended!) bakeries and cafes to pick up your picnic lunch.